BBC NEWS | Business | Can Airbus conquer the world? Can Airbus conquer the world? A truly enormous plane, an even bigger hangar to build it in, talk of a revolution in air travel, extravagant promises of airborne casinos, bars and shops. We've been here before. As the assembly of the Airbus A380 super-airliner begins, it is becoming apparent that in many ways its advent is just history repeating itself. Back in the mid 60s, almost the same claims were made for the Boeing 747 jumbo jet. It would carry more passengers, 400 to be precise, and enable airlines to slash costs. But the A380 has been designed for its time, and that means building-'em-big. There has been a huge increase in demand for air travel. This allows airlines to use even bigger planes than the 747, with less fear that they may fly with empty seats. The size of the A380 means it can take a third more passengers than a jumbo jet, about 555 people, so that fewer flights will be needed to carry the same number of passengers. Slots in and out of major hub airports are at a premium. And in the UK particularly, there's pressure to limit airport expansion. Airbus also promotes the A380's environmental credentials -- it does 95 miles to the gallon per passenger. The A380 thus consumes less fuel per passenger than its competitors. 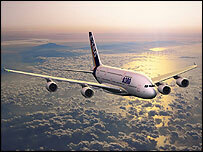 It is a sales pitch that has attracted orders from 11 international airlines, a total of 129 A380s to date. But what sort of business model are they signing up to? Put simply, A380s will fly to around 60 big airports around the world, the hubs. After all, it is a big plane and not all airports can handle it. Crucially, passengers wanting to get to smaller cities will have to transfer. More passengers per plane could create the potential for delays. And that is a big issue, especially when added to the increased security procedures on the ground. Perhaps to avoid criticism that its plane is designed to be 'cattle-class', Airbus has carefully marketed the A380 as a luxurious way to travel, its promo videos oozing spacious inflight shopping, showers, bars, and libraries. The full size mock-up of the plane in Toulouse, France, even has an onboard waterfall. There is space for all this, but it is a brave airline that doesn't fill that space with more seats. As the production of the first A380 begins, hopes are high that it will be a business success. The share price of EADS, the Airbus majority shareholder, has risen as a result. But the A380 is partly flying high because it doesn't have an obvious competitor. Boeing, the creator of the 747, pulled out of the race to build the world's biggest airline in 2001. Rather than building them big, it has decided to target the middle of the aircraft market. Its new 7E7 Dreamliner was launched in April. Dreamliner is designed to replace the existing 757 and 767 airliners which are getting old. Because it is smaller, carrying 230-300 passengers, it is arguably more flexible than the A380. Boeing believes the 7E7 can serve both short and long-haul routes. "Big jet ranges, with smaller jet sizes," as the company puts it. This will be good for airlines that want to fly more planes to smaller destinations. It will allow passengers to travel direct, without the need to change. So an intriguing question presents itself: Will the airline industry of the future want the build-'em-big, pack-'em-in A380, or the all-things-to-all-airlines 7E7? It is of course quite possible that they will want both. But it is worth noting that the first order for the 7E7 was from Japan's All Nippon Airways. Japanese carriers have been reluctant to sign up for A380s. Whatever happens, Airbus has the head start. The factory to show off, the full order book, and a date for the first A380 to go into service. 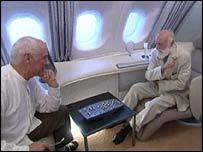 In 2006 a new chapter will begin in the history of air travel.